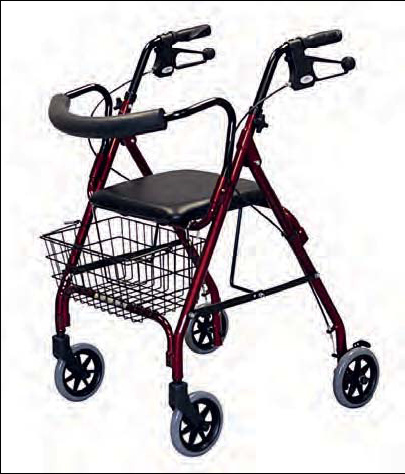 This rolling "walker" has a padded seat, curved backrest, and loop brakes for quick and easy stopping. It's easy to maneuver and folds for storage. Hand grips adjust to your height: measure 32" from floor in lowest position or 36" from floor in highest position. Pull on grips to stop, push to lock brakes. Seat is 14" x 14"; 22"H from floor. When open , unit measures: 24"W x 22"L and weighs 16 lb. Capacity: 250 lb. Basket comes standard. Also availible in Blue (MDS86810B) or Black (MDS86810BLK). Limited lifetime warranty on frame. Six month warranty on handgrips, push buttons, brakes, casters, knobs, brake cable, back bar, upholstery, basket and any other"wearable" parts.